While the Strip may rule when it comes to high-end luxury shops, Downtown has the edge in bargains and unique boutiques. For visitors, Downtown shopping offers a great excuse to see the sites outside the Strip. Fremont Street and the surrounding area feature some of the best souvenir shops as well as easily accessible convenience stores with everyday essentials that are much more affordable than those on the Strip. Downtown is where to find one-of-a-kind shops run by independent artists and retailers. It’s also one of two locations for Las Vegas Premium Outlets. 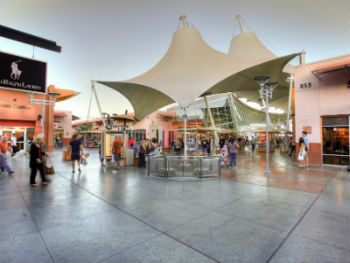 At 540,000 square feet, Las Vegas Premium Outlets North is the largest retail space in Downtown Las Vegas. This shopping mall features more than 150 stores set in a southwest themed “outdoor village.” The exterior evokes desert architecture with its tan walls adorned in stucco. This mall is a dream for those looking for name brands and great prices. With retailers like Coach, Guess, American Apparel, Dolce & Gabbana, Nike and Armani, serious shoppers can easily spend a whole day at Premium Outlets North. As an outlet mall, many of these stores feature special sale prices not offered at other locations. For bargain hunters, the north outlets can be a real treat. Since it’s mostly outdoors, temperatures can get pretty hot at the mall in the summer. Thankfully, there are plenty of tents for shade and misters to help shoppers stay cool. There is a large indoor food court with eight fast-food options to help those day-long shoppers replenish. The food court is near the information center, which sells coupon books and offers help for those looking to find a certain item. Store hours are 10 a.m. - 9 p.m. Monday through Saturday and 10 a.m. - 8 p.m. on Sunday. Located right off the I-15 Charleston Boulevard exit, Premium Outlets North is about a mile south of Fremont Street. While the area outside the facility is not very pedestrian friendly, there is a free parking deck on the property. The mall is operated by Simon Property Group, which also runs the Las Vegas Premium Outlets South mall on Las Vegas Boulevard. Of the two locations, the north outlet has more shopping options. Scattered among the casinos and bars, there is a variety of shopping options in the Fremont Street Experience. You won’t find name-brand retailers or anything “up-scale,” but there are plenty of souvenir shops and interesting kiosks that sit throughout the pedestrian mall. This shopping site is better for “impulse buys” rather than those searching for something specific. Often hidden behind the intense crowds of Fremont Street are a range of kiosks that sell anything from sunglasses and hats to baby clothes and watches. Some kiosks are set up by artists who do caricatures or airbrush paintings on the spot. Fremont Street is arguably the best place to indulge in souvenir shopping in Las Vegas. There are several affordable shops, most of which are concentrated between the Fremont Hotel & Casino and Slotzilla Zipline. These shops sell everything from silly T-shirts to playing cards, keychains, lingerie, gag gifts and other knick knacks. Popular gift shops include Fabulous Las Vegas Jewelry & Gifts, El Porta Indian Arts & Crafts and the Harley Davidson shop. 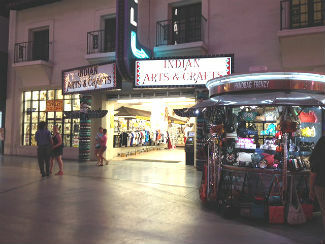 The Fremont Street pedestrian mall is also home to some reasonably priced convenience stores, such as ABC Stores and Walgreens. Both are open 24 hours. 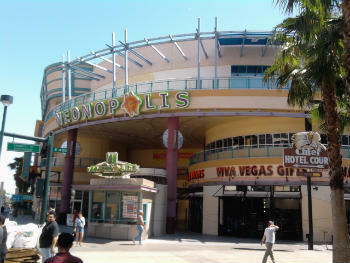 On the east end of the Fremont Street Experience near Las Vegas Boulevard is a 300,000-square-foot shopping center called Neonopolis. The complex features three open-air levels that surround a courtyard. A convenient underground parking garage sits below. Unfortunately, several shop closings have made Neonopolis somewhat more empty in recent years. Nevertheless, there are a few notable tenants, making this mall a “hidden treasure” for some. Popular shops include Rockstar Tattoo, Toy Shack and the notorious Heart Attack Grill restaurant. Store hours vary. In the Fremont East Entertainment District, just past the stretch of bars and El Cortez casino, visitors will find the entrance to Downtown Container Park marked by a 55-foot metal mantis. This unique 19,000-square-foot retail complex was built from shipping containers and features a striking industrial decor. Most of the park’s 25 shops are housed within these repurposed shipping cubes. At only 250 square feet, the cubes/shops can get pretty cozy. However, this forces the tenants to get creative with their use of space. Container Park is one of the best places to check out local owner-operated boutiques that reflect the spirit of downtown. You’ll find trendy one-of-a-kind women’s clothing stores like American Vagabound, Blue Raven Boutique and Boutiqueaholics. For those interested in unique art galleries, check out Lil’ Art Bodega and Disney Fine Art. There’s even a shop dedicated solely to leggings called Crazy Legs. 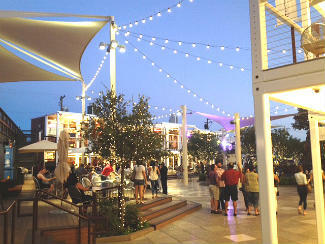 As a “multi-use area,” Container Park is more than just a high-concept outdoor mall. With a playground and daily activities, its one of the best spots downtown to take the whole family. Leave the kids to enjoy the 40-foot tree house while you shop. Shopping hours are 10 a.m. - 9 p.m. Monday through Saturday and 10 a.m. - 8 p.m. on Sunday. When it comes to antique shopping in Las Vegas, nowhere can compete with the Downtown Arts District. Within this roughly 18-block district, one can find 14 antique shops selling everything from clothing and furniture to posters and dishware. Many of the shops are located on Main Street near the corner of Charleston Boulevard. Las Vegas is a great for visiting collectors and hoarders as the antique shops are often stocked with vintage items reflecting the city’s casino culture. These are the kinds of items in which Medusa’s Antiques and Retro Vegas specialize. For those with a passion for old-school gaming and pinball, a stop at Main Street America is a must. 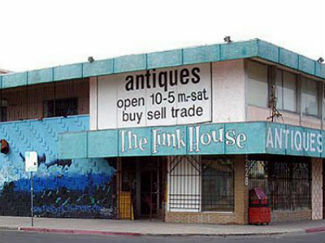 The Arts District is also home to the antique shop Rick’s Restorations, which is the subject of the reality series “American Restoration” on the History channel. Thanks to the Strip & Downtown Express and Deuce bus routes, all of these locations are accessible to those staying on the Strip. There are direct stops at the Fremont Street Experience, Premium Outlets North and the Arts District. For a quicker trip, cab rides can run anywhere from $15 - $25 one way from the Strip. Free parking is available in parking garages at the outlet mall and throughout Fremont Street for those with their own transportation.